This page is designed to help you understand what has happened to your California your property taxes. Q: What are Supplemental Property Taxes? A: The supplemental property tax is an additional tax beyond the normal annual tax for any increase in the value of property as determined by the Assessor. This will include the purchase of property at a value higher than the former assessed value, the addition of a home to a vacant lot or any other major improvements such as a new pool or the addition of a room onto a house. The supplemental tax is billed separately and reflects the tax on the difference in the new value of the property versus the old value. Q: Why did I receive more that one supplemental tax bill? A: You may receive more than one supplemental tax bill, depending on when you purchased your property or completed new construction. Because the secured property taxes are based on the January 1 value and cover a fiscal year, your purchase/construction date may effect the calculation of the taxes for two fiscal years. For example, if you purchased property in February 2013, your purchase would effect the 2012-2013 fiscal year taxes (February 2013 through June 2013) and the 2013-2014 fiscal year taxes (July 2013 through June 2014). The latter fiscal year is effected because the Assessor would have already established the value on January 1, 2013, prior to the purchase/construction. Therefore, the taxes calculated for 2013-2014 would also have to be adjusted by a supplemental bill to reflect the increased value. Q: When are my Supplemental Property Taxes Due? A: The supplemental tax is due upon the mailing of the bill. The supplemental bill is payable in two installments, like the secured bill. The delinquent dates of the installments depend on when the bill is mailed. A supplemental tax bill mailed between July and October carries a 1st installment delinquent date of December 10 and a 2nd installment delinquent date of April 10. Supplemental bills mailed between November and June carry a delinquent date based on the month in which the bill was mailed-the 1st installment is delinquent the last day of the month after the bill was mailed. The 2nd installment is delinquent four (4) months later. For example, if a supplemental tax bill is mailed in February, the 1st installment delinquent date would be March 31 and the 2nd installment delinquent date would be July 31. Q: My Property Taxes are Impounded in My Payment; Do I Still Have To Pay My Supplemental Property Taxes? A: Supplemental tax bills are mailed directly to the homeowner. If you have arranged for your tax payments to be paid through an impound account with your mortgage company, contact your lender regarding payment. The lender will not receive a copy of a supplemental tax bill. The supplemental tax bill will not automatically be paid by funds in your impound account. If you receive a supplemental tax bill and have any questions about payment responsibility, contact your mortgage company. Q: What Will Happen If I Don't Pay My Supplemental Property Taxes On-Time? Q: I am Veteran of the Armed Services, Are There Any Exemptions For Me? A: In order to be eligible for a Veterans' Exemption in Stanislaus County, a single veteran must not have assets valued over $5,000. A married veteran (or a veteran's widow who has not remarried) must not have assets valued over $10,000. For more information, call the Exemption Department of the Assessor's Office at (209) 525-6461. Q: I am Disabled Veteran of the Armed Services, Are There Any Additional Exemptions For Me? A: If you are a veteran with a service-connected disability (or if you are unmarried widow of such a veteran), you may be eligible for an exemption of up to $150,000 off the assessed value of your home. For more information, call the Exemption Department of the Assessor's Office at (209) 525-6461. Q: Why Did My Property Taxes Increase So Much? A: This is a question a lot of us could be asking when we open our property tax bill based on the latest assessment this fall. Unfortunately, the answer isn’t so simple – but I'll do my best to break it down……. California has two laws that affect the property taxes of your home; Proposition 13 and Proposition 8, both passed in 1978. Proposition 13 limits a County's ability to increase in your property taxes to 2% per year regardless of how much the market value of your home increases. Therefore, for many homeowners, property taxes will increase 2% over last year – regardless of market value changes. For Californians who have owned and occupied the same home for several years without any construction modifications, this isn’t necessarily NEW news. They’ve come to expect a moderate increase in their property taxes each year, and unless Prop-13 changes or goes away, they’ve no reason to expect anything different in the near-term. Put simply, Prop 8 allows for the temporary lowering of the assessed value of properties whose market value falls below their Prop 13 value. As a result of the historic decline in the housing market in that occurred from 2006 - 2010, county assessors throughout California have moved a large majority of our homes from Prop-13 status and into Prop-8 status. For those of us who's property was moved into Prop-8 as a result of the decline in the value of our homes (basically everyone in the Central Valley), this means that our property tax bills are no longer calculated based on a moderately increasing Prop-13 base year value trend + CCPI, but rather based on our property’s current market value. If you’re in this boat, you’ve likely enjoyed a decline in your property tax bill in the last few years. However, as property values increase, so will your property taxes. Now you may be thinking “Wait a minute, I thought my property taxes couldn’t increase by more than 2%?” and you would be correct if your home was still valued under the Prop-13 rule...but if your house was still valued under the Prop-13 rule then your taxes would be being assessed based upon the CCPI trend line and your taxes would be much higher! However, since the decline in the value of your home triggered the reassessment due to Prop-8 and the subsequent reduction in your property taxes, now while the value of your home remains under the trend line of the CCPI, your property taxes are subject to the assessment under Prop-8 and not Prop-13 and as such the assessments can change dramatically as the market value of your house increases. The chart illustrates a home purchased in late 2004 for a price of $475,000. Although the market value of the home during the first three (3) years increased at rates of +5.3%, +7.0% and +1.9%, respectively – property taxes were calculated against the Prop-13 trend line that prevented increases from exceeding +2% per year. In 2007 however, the housing market began its steady decline, and consistent with California law the county assessor moved the home from Prop-13 to Prop-8 status. Property taxes for this particular home then are no longer calculated against current Prop-13 base year value, but against the current Prop-8/Market Value. As a result, property tax bills also began to steadily decrease. However, as the market value of this home grows, so will its property tax bill – likely at a yearly rate much greater than +2% as long as it remains in Prop-8. So where’s the ceiling? Remember the Prop-13 base year value trend line hanging around in the background? That’s the ceiling. 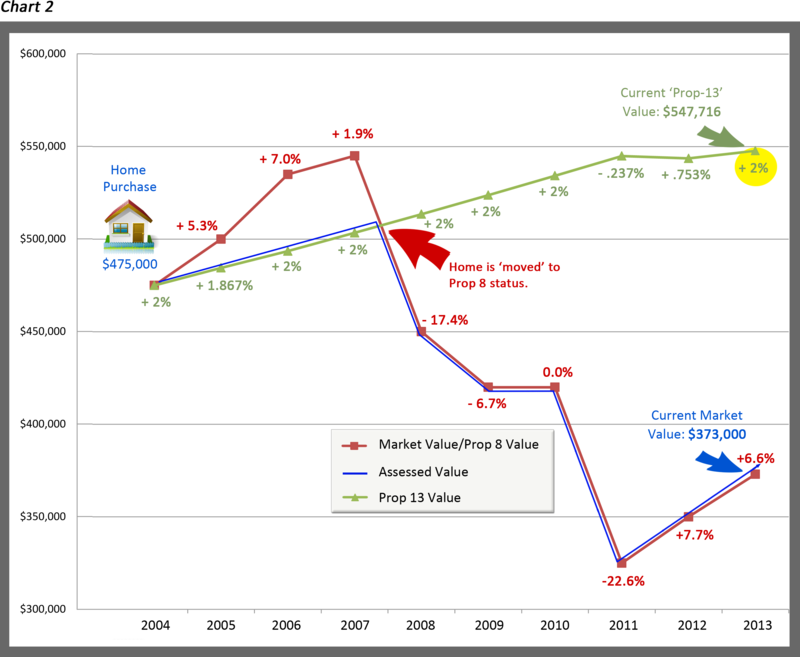 In the case of the home exemplified in Chart 2, that ceiling is currently $547,716 – the likely value of the home had the market never fallen and +$174,716 greater than current market value. 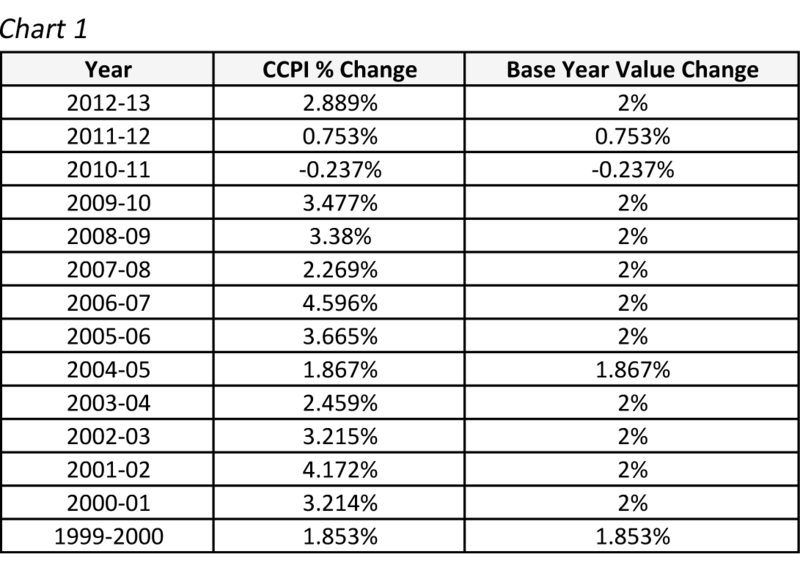 Therefore, until the market value of your property reaches the ceiling value of the CCPI, your property taxes will continue to fluctuate based upon the actual market value and the 2% increase will not apply.